Friends of the Soldiers Home’s monthly Saloon Night for residents on Nov. 7 was so packed there wasn’t even a place to sit for a while! The bluegrass band Fretnauts played “down home” music that had several attendees dancing. As usual, Friends also brought in beer and pizza to share, and residents and volunteers had a great time! Saloon Night next month will be replaced with the holiday tree lighting party. But Friends of the Soldiers Home will be back in January with a full slate of Saloon Nights in 2018! Put them on your calendar and join us — these events are always the first Tuesday of each month. To volunteer, write Lori Lincoln at volunteerfriendsofsoldiers(at)gmail(dot)com. 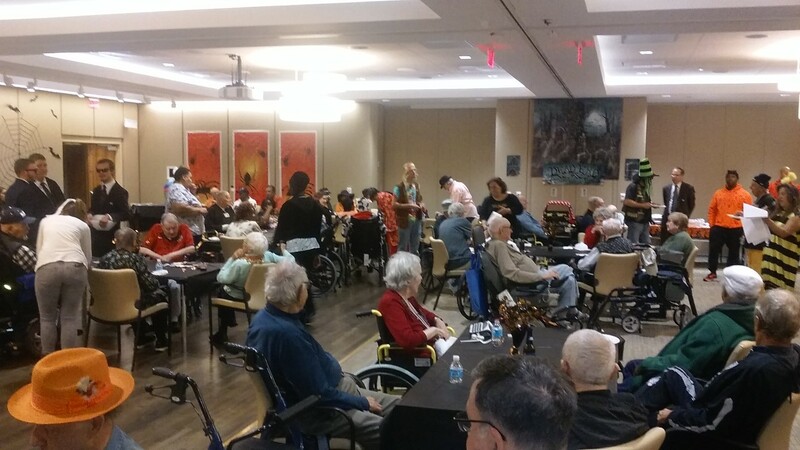 It was a wonderful evening celebrating Halloween at the Soldiers Home this week. 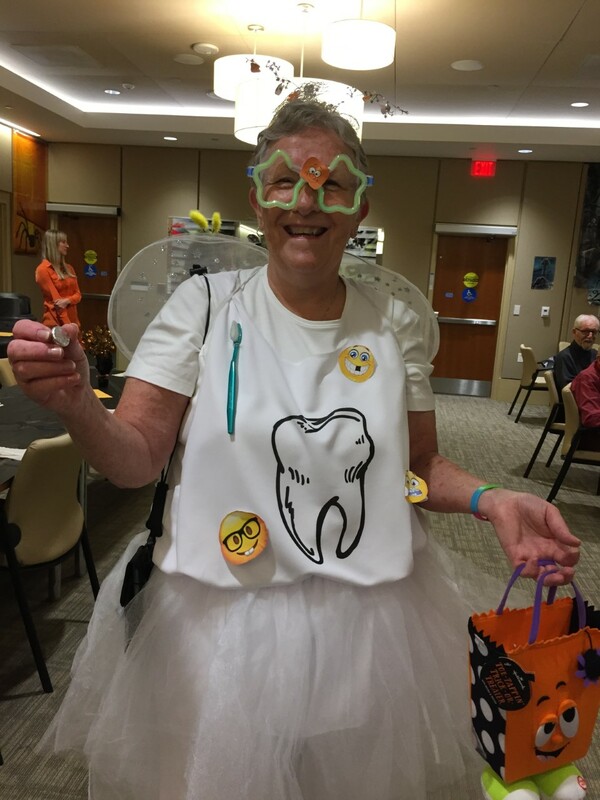 There were so many residents in costume! There was the Tooth Fairy; Lady Bug in deep conversation, and great chats with residents and volunteers. Come and join us in November as we move into the holiday season! There are lots of opportunities to volunteer. Check out our web pages for upcoming events and drop a line to our volunteer coordinator, Lori Lincoln, at volunteerfriendsofsoldiers(at)gmail(dot)com. Dear Friends, We are so sorry to report that because of expected weather patterns this weekend, the Armed Forces Retirement Home and Friends of the Soldiers Home are not going forward with Fall Fun Fest. We are so sorry to do this because we were so much looking forward to a fun day, and we know that you are too. But forecasts are for an extremely wet, windy weekend, and we feel this decision is best for all. Have no fear! Fall Fest was cancelled in 2013 because of the federal government shutdown and we came back strong in 2014. We expect great things in 2016! President Lincoln’s Cottage, which does so much to preserve the history of the Armed Forces Retirement Home-DC campus, has two big events coming up. The second-annual Freedom 5K featuring running icon Joan Benoit Samuelson is Saturday, Sept. 26 at 8am. Early-bird registration at a cost of $25 ends Aug. 26. Register here. Then, the fourth-annual Family Day is Saturday, Sept. 12 from 10am to 3pm. This free event includes a Civil War encampment, petting zoo, arts and crafts and live music. For those who want to take a cottage tour as part of Family Day, normal prices apply. Meanwhile, planning is underway for the third Fall Fun Fest on Sunday, Oct. 4. This will be a major collaborative effort of organizations including Friends of the Soldiers Home, the Home’s staff and residents, and Lincoln’s Cottage. Mark your calendars, more details will be coming soon! Photos courtesy of Lincoln’s Cottage. As usual we had great volunteers and a spirited game at Jingo this month! 3 young Marines and friends and family of our volunteer coordinator, Lori Lincoln, helped Friends host another nice event for our neighbors at the Home. After getting off to a slow start, Ms. Bradford took home the night and just won and won and won! The volunteers who helped her went home walking on air too – there is much belief in good luck at Jingo! Volunteer Denver and Mr. Palmer were enjoying each other’s company as usual, and so much so that they forgot to yell out “Jingo!” as soon as they’d won a game; however, when they discovered the mistake a few calls later, the new winner Chris graciously split the big $10 pot with him. Big prizes all evening: $5 per game, and one $10 restaurant gift card! Come join us next month – bring one of our veterans a little bit of your luck! 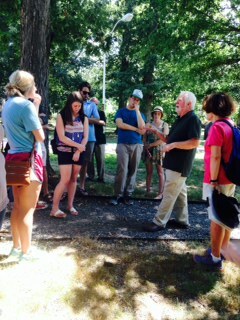 Phil Blair captures students’ attention when he talks about how the geology of the campus developed. Friends of the Soldiers Home helped link the American history of the veterans’ campus with its natural history. 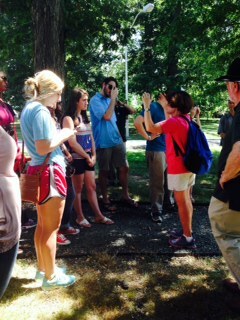 After students from Michigan State University and Mississippi State University toured President Lincoln’s Cottage on Saturday, Friends arranged a walk for them with naturalists Mary Pat Rowan and Philip Blair. The students were able to explore geologic, aquatic and woodland features of the site as part of their coursework on “Elements of Federal Policy Development in the Natural Resources Arena.” Mary Pat and Phil lead similar naturalist tours for the Friends as part of the Spring Fling celebration each May. Friends would like to thank veterans of the Home for opening their space for this wonderful educational endeavor. We also thank the students’ instructor, Executive in Residence Mark Rey, for making this historic and important campus a part of the students’ study. 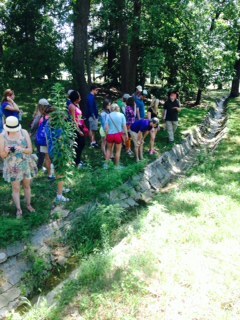 Students learned about the ancient, underground Tiber River on campus and previous efforts to channel waterflows. Mary Pat Rowan gestures to surrounding trees as she talks about the property as an example of a healthy upland forest.